One of the more interesting aspects of studying and teaching history is discovering common cultural memes between past and present. For example, Aristophanes’ The Clouds is a 2400 year old Athenian play that lampoons higher education. The play’s criticisms of Socrates’ “thinkery” are similar to contemporary charges of impracticality inherent to an education in the social sciences and humanities. A more recent example is the invention of the Phantasmagoria machine/show. From the 17th to the 19th century, phantasmagoria practitioners shows used light, shadow, and narrative to produce an other-worldly experience for otherwise bored urbanites. The popularity of the phantasmagoria show increased as technology advanced into the 19th century. Therein, the city dwellers of post-Enlightenment Europe, a time period which embodies the triumph of science and engineering over superstition, were hungry for something that took them beyond the alienating nature of the urban space. Though the phantasmagoria machine has since given way to gothic literature, film, television, and interactive media, I think the essential desire to remove one’s self from a known world, albeit temporarily, is as pervasive now as it was centuries ago. For a time horror movies were the ultimate realization of the phantasmagoria show. Film offered a communal experience of witnessing something so far removed from the mainstream that its very idea was unsettling. Masterpieces like The Exorcist even managed to capture the primal subject matter of early phantasmagoria shows and gothic literature. Film, however, was and largely remains passive and impersonal. Modern movies are edited to suit as wide an audience as possible. They are also inherently less engaging than a phantasmagoria show as the horror isn’t happening to the viewer, as was the case in the 19th century shows. The movie audience is merely a witness, safely removed from the events on screen. Video games and interactive media took a step to address that fundamental disconnect. I became aware of this distinction, though on a very rudimentary level, the first time I played Final Fantasy. Where other games gave me an established hero as an avatar, Final Fantasy was about a martial artist named Adam and three of his friends. A few years later I played the original X-Com: Enemy Unknown. Once again I engaged with the (probably) impossible concept of aliens invading the Earth. In naming a soldier after myself, I was able to process events and emotions theretofore unknown to me. I didn’t see an archetypal tough guy reduced to panic when his comrade – named after my ninth grade crush – was shot dead. I saw Adam Shaftoe panic, drop his gun, and turn tail. Fallout, Pokemon, Mass Effect, Wing Commander, all of these games explored some level of transcendent effect through personal engagement with a narrative, either scripted or internally constructed. A nerdy white kid from the suburbs could feel second-hand emotions and concepts that were otherwise incongruous with a safe upbringing in the developed world. This is one of the reasons why I will always make the case that some – not all, defiantly not all – video games should be treated as art. If a video game meets a means test of being didactic, allegorical, narrative, or evocative, then there’s good reason to explore its artistic value. Which brings us to The Sims. The Sims is the antithesis of the phantasmagorical. It is the video game equivalent of Sunday school, a place where preconceived notions of orthodoxy are reinforced through repetition and rote learning. The Sims doesn’t want you to explore. Rather, it wants you to play the game in a very specific way, doing very specific things at very specific times. If you deviate from this checklist, which just so happens to be rooted in the most stunningly boring vision of 1950s American suburban propriety, you lose. The Sims is Lee Carvello’s Putting Challenge. This hatred stems from the fact that The Sims presents itself as the ultimate opportunity for an otherworldly experience: create a new version of yourself and see what happens. Yet this life is defined within the strict boundaries of getting a job, buying a house, filling it with material junk, mating with a person of the opposite gender, and then dying of old age, home invasion, or abject stupidity. Could a game be more bereft of creativity? Could something be more pointless in its execution? 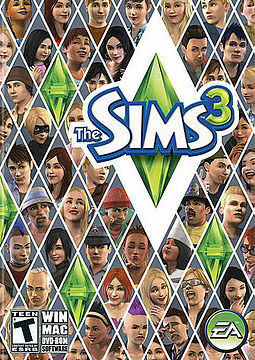 The Sims is the embodiment of the alienating modern/post-modern life that people turned to phantasmagorical experiences to escape. The game is so obnoxiously officious in its adherence to the expectations of “life” that I killed my Sim-simulacra out of sheer malice (and envy). Sim-Adam had a three bedroom house, a wife, cars, and was rapidly progressing through a career within a functional meritocracy. At the same time, real Adam was working in a call centre after finishing a Master’s degree – wherein various employers told him he had no employable skills – living in a basement apartment, and dating his laptop. Sim-Adam had to die. Was it murder or suicide? Were it either I would make a case for The Sims as a phantasmagorical experience. But no, I was guilty of subverting the spirit of the game, and it was apt to punish me for my transgression. Sim-Adam’s wife, Aeryn Sun-Shaftoe, soon refused to do anything but cry. Her career suffered. She began eating nothing but take-out. Attempts to hook her up with a new neighbour, John Crichton, failed. The game wanted me to witness the inevitable and wholly predictable consequences of my poor stewardship over Sim-Adam. In the years since that fateful game, The Sims has only grown more tedious. A post-recession economy has transformed the idea of getting a job, climbing the ladder, and buying a house in which one can die into a modern myth. Under that lens The Sims is nothing but nostalgia for bygone days. There is no lesson to be found in it. It is absent narrative save for whatever milquetoast and utterly normal trappings a player chooses to tack on to their character’s day job as an actuary. The Sims, and other “life simulators,” turn their nose up to the artistic potential of the medium in favour of occupying a player’s time with tasks they could otherwise do in their alienating everyday life. Despite this reality, The Sims managed to sell millions of copies and garner no short supply of positive critical reviews. It ushered in a prolific (and painful) body of work in casual/social gaming. Thus do I conclude with a question: can casual games/life simulators create a transcendent experience akin to the phantasmagoria show? Is there something otherworldly in farming potatoes? Or will they only ever amount to glorified distractions?